Hello lovelies, I hope your weekend is going alright so far. I have been busy with university, so I am quite stressed and it's starting to show. I have bags under my eyes and my skin isn't fairing to well either, which is why I was in desperate need of a new primer and foundation. The new novelty of my Revlon primer + foundation had kinda wore off and it wasn't doing as good of a job as when I first bought it. Although I suppose that is the case with most primer + foundations, you have to switch it up every now and again. So I decided to try out Max Factors next, I have already gone through Maybelline (great makeup base), Bourgois (not that keen about their primer/foundation), Revlon (loved both) and Rimmel (foundation was really caky). Those are all the ones I can think of right now, but L'Oreal is another one I need to try. PRODUCT DESCRIPTION: The Secret ingredient of our Best-selling foundation is now a product in its own right. Simply apply Facefinity Primer under your favourite foundation to prime, mattify and hold your flawless beauty look in place for longer. I have had this product for months and months, I have been meaning to write a review but just haven't got around to it, as you can probably tell by the photo it is nearly empty. I always reserve judgment until after I have been using it for at least a week, so that I can see if it works or if I am just having an off day where no matter what I put on my face it won't look right. 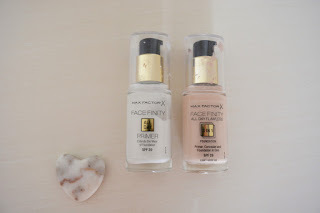 I haven't really tried much from Max Factor before, so I was quite excited about trying these products out. The primer was much more liquidy than I imagined if that makes any sense and reminded more of a moisturiser than anything. It does help soften my face, however, it does not feel that matte. It does hold my makeup quite well, but I'm not really a fan of the texture and I prefer a thicker primer texture. Is it worth repurchasing? I always think it is important to put this in reviews as it shows how much I really like or dislike the product. Personally I would not buy the primer again, as I do not feel I am getting my moneys worth and prefer Maybellines' much more, plus it is cheaper. My favourite primers so far have been Maybelline and Benefit. Whilst that primer wasn't for me, you should definitely try it out for yourselves first as it may just be my skin or own preferences. PRODUCT DESCRIPTION: 3 in 1 foundation holds like a primer, corrects like a concealer with the long lasting finish of a liquid foundation with SPF 20. I have yet to find a foundation I am in love with, I have not found my perfect foundation and I think I may go for MAC's. I have tried most of the drug store brands and just do not feel they are that great, Revlon as said before is my favourite so far. I was looking forward to try Max Factors as my housemate has it and it looked really good on her. I was quite disappointed by it and very much like the primer it is very liquidy, which I don't really like. It is an ok foundation but not a great one and the quality is not that great. I have come to find that if you put on a normal amount, it doesn't look like you have makeup on and just slightly covers my face. However, if you double up on the quantity it looks like you have caked it on and can come out a tiny bit orangey. It is a loose-loose situation really and no matter what I do it is not the result I want. I tend to use my Max Factor foundation only when I'm going to uni or something that I don't really care what my face looks like. If you want a very natural look with a slight tint of foundation then this is the one for you. Despite not getting on too well with the primer and foundation, it has not put me off buying any of their products in the future. I look forward to trying their lip products and a variety of their other beauty products.